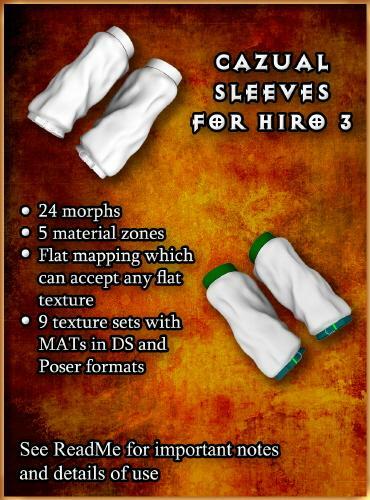 Conforming pair of sleeves for Hiro 3. 24 morphs (including DAZ and some Netherworks FBMs), 5 material zones, 9 texture sets in Poser and DS format. In the ReadMe you can find useful tips and notes as well as rules of use. You can make commercial or non-commercial renders and prerendered animation with this pack but you can't redistribute it, sell it, make a derivative work from raw content of the pack (mesh, textures, cr2 and so on) or claim it as your own. Due to changes in Second Life EULA as on October 2013, the use of this content in Second Life in any shape of form is especially prohibited. Somewhat tested in Poser 5, Poser 7, DS 1.8 and DS 2.2. Thanks for the freebie and for the link mention!